Even small amounts of red and processed meat – such as a rasher of bacon a day – can increase the risk of bowel cancer, according to research. The latest study led by Oxford University and funded by Cancer Research UK, adds to evidence, including from the World Health Organization, that eating red meat can be harmful. But exactly how big is the risk? And how much is too much? Researchers analysed data from almost half a million people involved in the UK Biobank study. Over the six years of their study they found 2,609 people developed bowel cancer. It’s not clear. Cancer Research UK says 5,400 of the 41,804 cases of bowel cancer seen each year in the UK could be prevented if people did not eat processed meat at all. But the charity acknowledges smoking poses a much bigger risk, causing 54,300 cases of cancer each year. 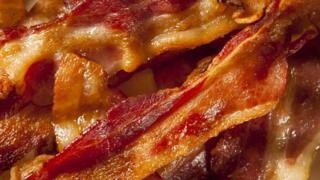 Public Health England says from their surveys many people eat too much red and processed meat. And experts advise people who eat lots find ways to cut down. The Department of Health advises anyone eating more than 90g of red and processed meat a day should cut down to 70g. NHS guidance says there are some benefits of red meat – for example iron and protein content – that must be balanced against potential risks. People can still eat meat and be healthy. Processed meat – including bacon, sausages, hot dogs, salami – is modified to either extend its shelf-life or change the taste – the main methods are smoking, curing, or adding salt or preservatives. It is thought that the chemicals involved in the processing could be increasing the risk of cancer. High temperature cooking, such as on a barbeque, can also create carcinogenic chemicals. When it comes to red meat like beef, lamb and pork, there are suggestions that one of the proteins (that gives it its red colour) can damage the gut when it is broken down. But experts are still trying to fully understand the link. Professor Gunter Kuhnle, at the University of Reading, described the study as a very thorough analysis of the link between meat intake and bowel (also known as colorectal) cancer. He said: “The results confirm previous findings that both, red and processed meat consumption, increase the risk of colorectal cancer. “The increase in risk of approximately 20% per 50g increase of red and processed meat intake is in line with what has been reported previously, and confirms these findings. She said it was known that “a range of lifestyle factors have a significant impact on the risk of bowel cancer, most notably age, genetics, lack of dietary fibre, inactivity and high alcohol consumption”.